A student has shared their rather unique solution to remembering answers in a physics test. 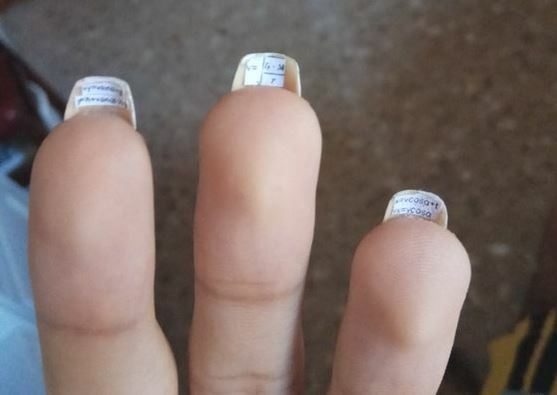 The unnamed student really ‘nailed the exam’ by writing the equations needed for the test on tiny pieces of paper and then sticking them underneath her fingernails. Posting a photo on Reddit, the student received a rather mixed reaction in the comments section with some hailing her resourcefulness and others slamming her for not revising. And just think, the amount of time and effort to painstakingly attach those little bitty cheat-sheets could have gone into actually learning the material. Many physics buffs have also slammed the Reddit user known as Blood_Reaper for failing to memorise ‘super simple equations’. Lol commendable effort, but cmon! You could’ve just memorised those formulas! All that effort, just to remember some easy formulas? I have bad news for you, if this is real, and you’re just starting out in college. it only gets harder, so you’d better learn the basic information now. The biggest question we want to ask though is how is someone’s eyesight THAT good? Seriously though, how can anyone even read that teeny tiny writing?